> Articles > Compensation to be Paid for Properties Affected by Power Cable Connection Projects – Maybe? Compensation to be Paid for Properties Affected by Power Cable Connection Projects – Maybe? Compensation would be given to locals whose farmlands or fruit tree plantations were affected by the two power cable projects from Myawady to Mawlamyaing and Myawady to Kawkareik. 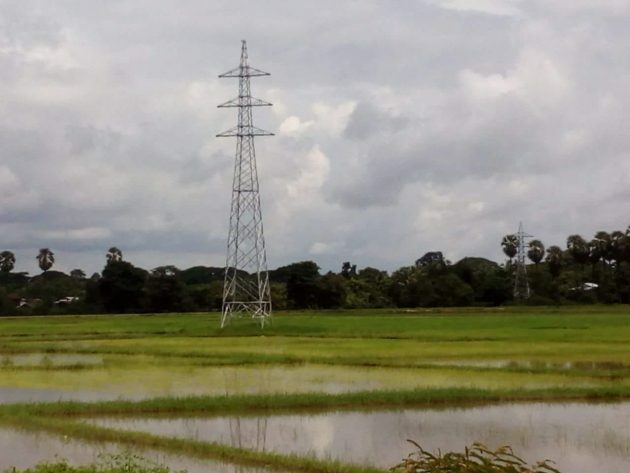 The Myawady-Mawlamyaing 230 KV and Myawady-Kawkareik 66 KV power line projects is being built, some of its towers run through farmlands and plantations. Government officials have said that a committee will be formed to assess the matter and will submit findings to the union government. U Soe Hlaing, Minister of Electric Power spoke to Karen News about the project. Although township officials were instructed to start listing and budgeting for the affected properties, U Soe Hlaing said that the township officials had not yet started. However, in Mawlamyaing there have been some meetings and negotiations with the locals, he added. The project will lay two power lines, one between Mawlamyaing and Myawady stretching 58.6 miles and the other line is between Thingan Nyinaung Power branch station and Kawkareik, which is 18 miles. Saw Tun Win who is affected by the project, lives in the No (6) quarter of Kawkareik told Karen News that the compensation process will be complicated as much of affected land does not have legal titles. Saw Naung Boe, a villager from Ywar Thit Gon village said that although betel nut gardens on the hill region of Dawna Range were damaged, the company that set up the lamp posts would only pay locals for the damaged trees due to their lack of land documentation. The construction of the project was broken down into localities and offered to contractors. The project had been divided into 15 parts and offered for tender. As many as 11 parts of the project in Karen State have been given to Chit Lin Myaing Company- the company of Colonel Saw Chit Thu, who server as a senior advisor and general secretary of the Karen State Border Guard Force central command. The other four parts in Mon State have been offered to a different company. Although the construction of the power towers that have been affecting the land, gardens and yards near Kawkareik, Tadanku villages and through the Dawna Hill along the new Asia highway began in early 2016, villagers said that the government officials and the company’s representatives only began educating the locals on how they could list damage to their land in July. The power cable connection project began in the 2014/15 fiscal year under the U Thein Sein government. The project was stopped because of armed conflict in the area. Now under the NLD government, the project has resumed and it is estimated that it will begin supplying electric power in the 2017-2018 fiscal year.